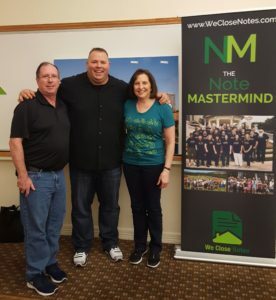 Bike Homes spent the past weekend attending Scott Carson’s Note Mastermind in Austin, TX. For those of you that don’t know what that means, it means we are a member of an elite group of investors who are focused on buying distressed assets for their own portfolios. Our Mastermind meets three (3) times a year to network with other likeminded investors, build relationships, and share and learn best practices from the best of the best. The past weekend provided valuable information for us to help continue to grow our business and knowledge. “Mastermind groups offer a combination of brainstorming, education, peer accountability and support in a group setting to sharpen your business and personal skills. 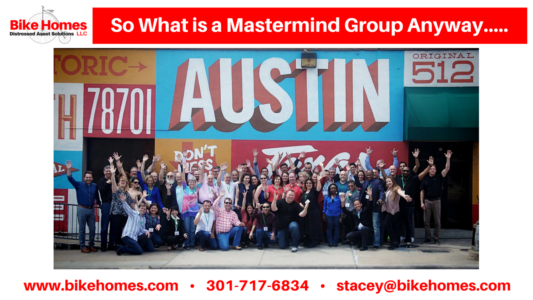 A mastermind group helps you and your mastermind group members achieve success. Our Note Mastermind is led by our mentor, Mr. Scott Carson, who was chosen the Note Educator of the Year in 2014. So, one could say we have learned from one of the best in the industry. We dedicated ourselves to becoming a member of this mastermind so that we can be the best project managers for our real estate projects and those investors who chose to partner with us in growing their investment portfolios. Our Mastermind group is like our extended family in that we encourage and help each and every member as they strive to succeed in their business. Over the weekend we received a presentation from Mr. Nathan Long, of Quest IRA on best practices on Using Your Self Directed IRA (SDIRA) to invest in notes backed by real estate. In addition, we had several presentations from the Singer Law Group (Mr. Joel Markowitz and Daniel Singer) focusing on loss mitigation and foreclosure processes. We broke down numerous assets working through the due diligence process of selecting notes and the working through the various exit strategies available. One topic covered was on using the Pipedrive CRM tool, (presented by fellow Mastermind member Mr. Adam Adams) to track assets through the lifecycle from purchase to workout of the note. Our mentor and leader of the group, Mr. Scott Carson presented several discussions on asset breakdown strategies, self and business development, reviewed future trends, as well as question and discussion throughout the entire weekend. He also inspired our group to work to a higher level in each of our businesses, challenging us to step outside of our comfort zone continue to grow our business for success. Towards the end of the weekend, each member got to “Pick a Duck” or “Chuck a Duck” to get a position in the Note Draft that will follow on later this upcoming week. That means we each drew a rubber duck that had a number on the bottom that represented our draft order. We were lucky enough to pick the #1 spot! If you were not lucky enough to get a high number, you could try to throw your duck back into the “pond” (a box that held the ducks) to get a better position if you got you duck back into the box by shooting a “basket.” By picking the #1 spot, we will be assured to get our favorite asset from the pool of over 600 that will become available for us to bid on. The list of assets will be available to the Mastermind members early in the week so that we can begin to do our due diligence process to select assets for our own portfolios that will be profitable for ourselves and our Joint Venture Partners. Stay tuned for details as we go through our due diligence on the 600+ assets and place our bids during the Note Draft later this week. If you would like more information about Bike Homes or how we can help you turn your investments into profitable solutions, I encourage you to reach out to us either on our website at www.bikehomes.com, or one of our many social media accounts including Facebook or LinkedIn or email us at Stacey@bikehomes.com.